Google My Business (GMB) is a free tool offered by Google that allows businesses to control their presence on Google across Search and Maps. By enhancing your GMB listing with accurate and rich information, your business can improve its organic growth by increasing its visibility on local Google searches, and therefore be more easily found by potential customers. We cover the importance of organic growth for measuring SEO growth in our previous blog post. Your GMB listing is a lot more than just having your address, phone number and business hours listed. 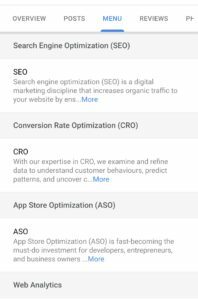 With Google recently updating and adding a bunch of new features to GMB, it is important for you to not only manage your GMB account on a regular basis but to keep up-to-date with the latest optimization opportunities. With that said, let’s go over the key GMB features in 2019. Your Business Description feature is a great opportunity to showcase what makes your business unique. Descriptions can be up to 750 characters and is shown on both mobile and desktop versions of Google Search and Maps. Place the most important information and keywords — including your city — towards the front of the description. Only the first 250 characters are displayed before your description is cut off in the Knowledge Panel. Include Long-Tail Keywords when possible. Make sure it’s captivating and informative. The Question and Answer feature can be seen when someone clicks on your business listing on Google. It allows Google users to ask questions about your business directly on the listing, and for your business and other users to respond. This provides a convenient way for both parties to communicate with one another. However, slow response times to questions might lead to lost revenue, and completely failing to answer questions will inevitably have the same result, plus it shows a lack of professionalism and organization. As such it is important to frequently check your Google business listing to ensure questions are being answered. Doing so will also allow you to verify if the answers provided by other users are correct. The longer an incorrect answer stays on your listing, the more people are going to see it. As of this writing, the Questions and Answers feature cannot be managed on the GMB account page or in the app. Meaning you will need to use Google to monitor this section of your listing. This can be done on desktop or mobile devices by performing a search query for your business. 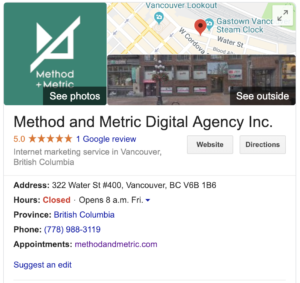 You may have to use Google Maps if your business listing does not appear in Google’s search engine results page (SERP). In an effort to make things easier, Google has started sending out notification for new questions to make managing, well, more manageable. Add your own frequently asked questions. This allows you to preemptively answer common questions from your customers. Upvote questions you think are most helpful to your customers. Questions with the most upvotes will be shown first, making them more visible. Google allows you to post on your business listing, allowing you to showcase your latest product releases, upcoming events, announcements, blog articles, company news, special offers, promotions, and anything else you can think of. This encourages customers to learn more about your business straight from Google. 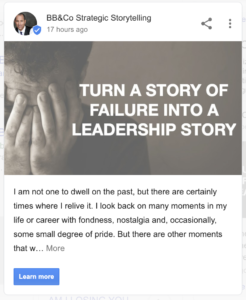 You can also add a link on each post to your website, allowing customers to go directly to the blog article, product, or whatever page that your post was in reference to. If your website isn’t already on the blogging train, here’s why you need to hop on. As of this writing, posts can be viewed using Google Search for desktop and mobile devices (as long as your listing appears), or the mobile version of Google Maps. Posts do not appear on the desktop version of Google Maps. Posts can be created and managed on your GMB account. Each post can have one image and up to 300 words, with the recommended length being between 150-300 words per post. Link the original post from your website. Include tracking link within Google post button to measure the ROI of these posts. Use high-resolution visuals (images and videos), as they have been shown to perform better. The Services feature allows your business to create custom service categories. You can have multiple sections with multiple items, and add prices and fully detailed descriptions for each one. This makes it easy for customers to learn about your business offerings and what to expect. Services can be added using your GMB account. Unfortunately, it is currently only available for certain business categories and businesses without a third-party ‘menu’ link. As of this writing, Services are only displayed on the mobile version of Google Maps under ‘Menu’. Attributes allow customers to quickly learn that your place of business has free Wi-Fi, or offers takeout options, or accepts credit card payments, or are wheelchair-accessible, or what you are popular for, and so on. It is especially useful for businesses that provide a service or product at their business location. Think restaurants, cafes, bowling alleys, gyms, barber shops, clothing stores, etc. In other words, if customers are spending time at your place of business, you’ll want to have attributes on your GMB listing. The list of available features that you can add to your business depends on what category your business falls under. Some factual attributes are directly editable by businesses on their GMB accounts, whilst other subjective attributes rely on Google users (e.g Popular with locals). Recent additions by Google include ‘women-led’ and ‘LGBTQ friendly’ attributes. Google Virtual Tours are a useful feature for businesses that aim to provide an experience for customers at their place of business. It allows customers to get a 360 interactive experience of your business location, which is essential for businesses where the layout, design, or atmosphere are what attracts customers. A hired professional with a ‘Google Street View Trusted’ badge is required to capture and create a Google Virtual Tour. This is because Google’s photograph requirements are strict, requiring the use of high-end camera equipment. Despite this feature being one of the more costly ones, it should only be a one-off expense that would not require regular monitoring once it is set up. Moreover, listings with photos and a virtual tour are twice as likely to generate interest in booking a reservation or making an appointment at your place of business, according to a study by Google Street View. This feature allows customers to go directly from your Google business listing to the contact/appointment page of your website. This might help increase your appointment conversions since the conversion funnel is shorter. You can easily add this feature by adding the URL of your appointment or contact page to your listing. Unfortunately, this feature is currently only available on the desktop version. Be sure to add a tracking link to measure the effectiveness of the feature. 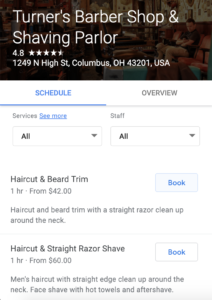 In contrast to the Book an Appointment feature, the Booking Button allows users to schedule appointments with your business directly from your Google listing. This provides even more convenience to customers since they do not have to leave Google. Furthermore, this feature is actually available for both mobile and desktop users. The one drawback of this feature is that you must be using one of the supported scheduling providers. The list of providers can be found here. Prior to the existence of this feature, businesses that were not officially open could not have listings on Google. This meant that customers were not able to find such businesses on Google, making it difficult to build online awareness and legitimacy. This feature removes that barrier by allowing business to have a GMB listing before it is officially open, showing the expected opening date, operating hours, and what to expect. It also provides a convenient avenue for B2C communication and engagement. One of GMB’s original features, this feature has evolved to offer more specificity. This feature is useful for service area businesses that offer delivery or travel-to-you services within their area of business. For example, a pizza restaurant that offers delivery to certain neighbourhoods can now specify their service area with greater precision. Before, businesses could only specify their service area using the distance from its location (E.g 5km, 10km). This posed a problem for businesses wanting to serve a greater area in one direction whilst avoiding an area in another. 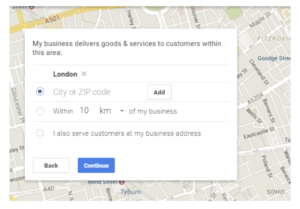 Businesses can now set their service area on their GMB accounts by specifying the region, city or ZIP/Postal Code. 1) If a business does not serve customers at its business address (delivery or house calls only), it can leave the address field blank and only enter its service area. 2) If a business does serve customers at its business address in addition to having a service area, it can enter both its business address and service area. 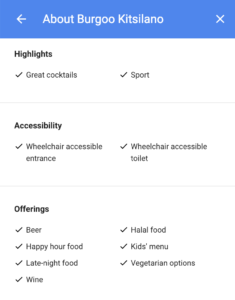 When enabled, mobile users will see a ‘Message’ button on your Google business listing, allowing them to send you messages directly from there. This allows customers to make inquiries and is especially useful if customers do not want to ask a question publically on the listing. When a customer sends a message, you will receive a notification from your GMB app, where you can then view and respond to the message. As of this writing, this feature is only available to select merchants in select countries. Quality: The photo should be in focus and well-lit and have no alterations or excessive use of filters. The image should represent reality. Logo: Used to help customers identify your business with a square-sized image. Cover photo: Used to showcase a brand page’s personality. cropped to fit a 16:9 aspect ratio. Check out our blog post on Optimizing Visual Content on your website. In addition to posting photos, Business can now add a short 30-second video about the company. The point of the video is for business to showcase a snippet of their brand and offerings to customers. Videos that are 720p or higher and up to 100mb can be added using your GMB account. Similar to photos, customers are also allowed to add videos, which if are inappropriate, can then be flagged by businesses. As such, this feature is one that should be monitored rather frequently. Some businesses have reported uploading 60-90 second videos with no issues. However, some articles are suggesting to keep the video close to 30 seconds in order to keep the viewer’s attention. 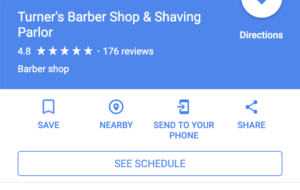 Need help with optimizing your Google My Business features? Say hi to Method and Metric.